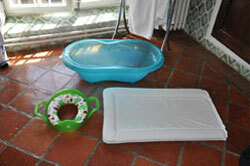 Having young children of our own you'll find La Bique very well equipped for kids. 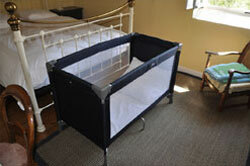 We have two cots, two high chairs, a changing mat, a bath, a toilet seat and and plenty of crockery, cutlery and cups. You'll need to bring your own bed linen for the cots though. Baby sitting is available at short notice. Details in our guest book. 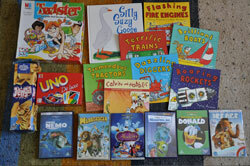 We have plenty of games, books and DVDs to keep the kids amused when parents need a breather. The pool is fenced with self closing gates, the stairs and mezzanine balcony have rods fitted between the balustrades so that little heads cannot get stuck, and the grounds are fenced off from the road, so that parents can spend a worry-free time with the kids free to roam as they want. 50% warm sunny days when we used the pool and 50% perfect days for touring (Musee de Foie Gras and Musee de Pruneaux not to miss).